This page is updated Week 4 of each regular academic year quarter to include Canvas usage data, per the definitions and explanations below. Usage stats are provided from the final quarter of the UCI Canvas Pilot (Winter 2016) going forward. This chart visualizes the information in the "Data" section below. Instructors: Calculated by dividing the number of unique Instructors of Record for all course codes in the Schedule of Classes by the number of unique instructors associated to a course space in Canvas for the given term. Students: Calculated by dividing the number of unique students enrolled in all course codes in the Schedule of Classes by the number of unique students associated to a course space in Canvas for the given term. EEE+ CanvasCounts, a home-grown tool that pulls data from Canvas to calculate the number of unique teachers, students, and sections associated to course spaces in the given term. EEE Legacy Stats, a home-grown legacy tool that pulls data from EEE Legacy (via our Registrar data feed) to calculate the number of Instructors of Record, students, and sections in the given term. 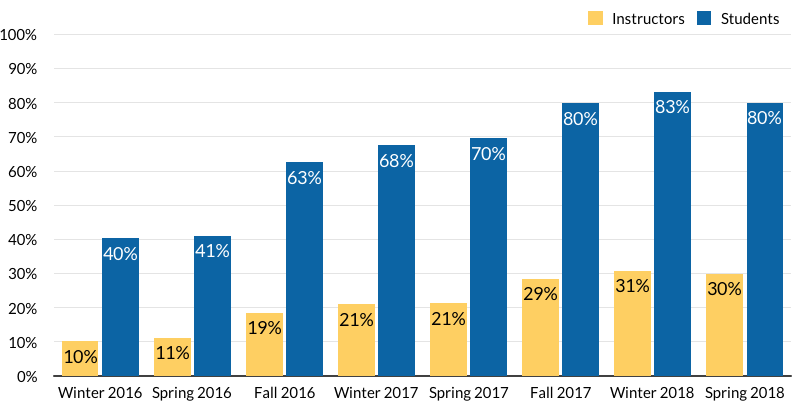 This data fluctuates throughout the term as TAs are added and removed from classes and other changes are made to student enrollment, instructor associations, and sections.